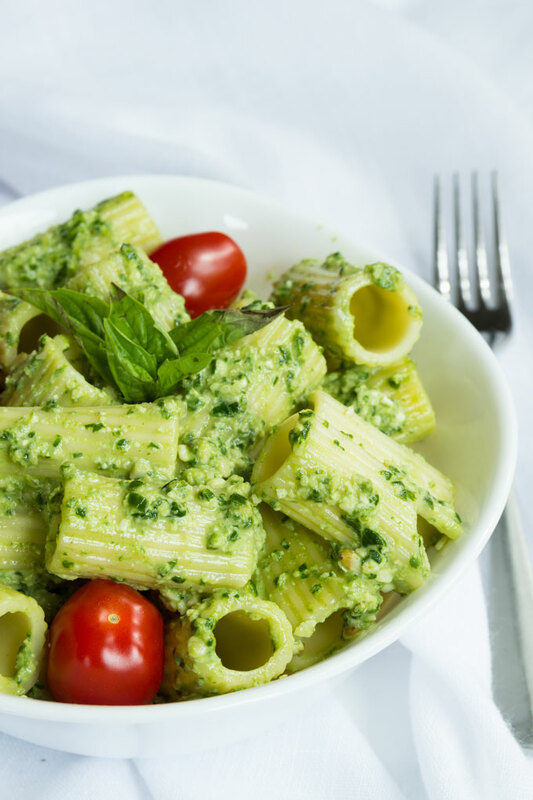 Basil pesto is a classic Italian sauce bursting with fresh herb-y flavor. 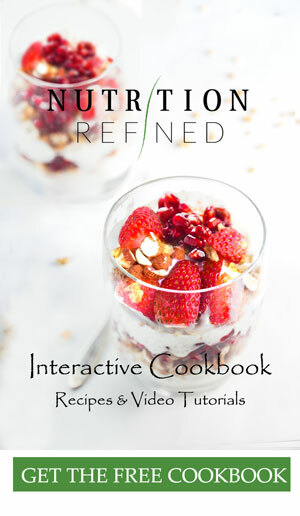 It’s simple, raw, and requires only a few ingredients. I love it not only for its simplicity, but also its pungent flavor – loads of fresh basil, raw garlic, rich nuts, and cheesy nutritional yeast. I love cooking foods that my husband (Tanner) loves. Watching his face light up when I make mac & cheese, makes my day. However, there are also food that I love but he doesn’t care for. Tanner is usually very appreciative of my cooking so even if he doesn’t like anything, he rarely complains. But I can read him like a book by now and can tell when he doesn’t like something. Even if I like certain foods he isn’t a fan of, it just isn’t that much fun to cook it just for myself. Basil pesto was one of such foods. Tanner isn’t fond of garlic, finds fresh basil much too strong, and thinks the green color is, well, too healthy-looking. But because I love pesto so much, I wasn’t willing to just give up. Not this time. 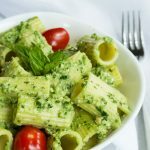 So, I’ve made dozens of different pesto recipes over the years – avocado pesto, sun-dried tomato pesto, hemp seed pesto with spinach, kale pesto, and secretly hoped that one of them would become also Tanner’s favorite. Every time Tanner didn’t light up after the first bite, my heart sank. 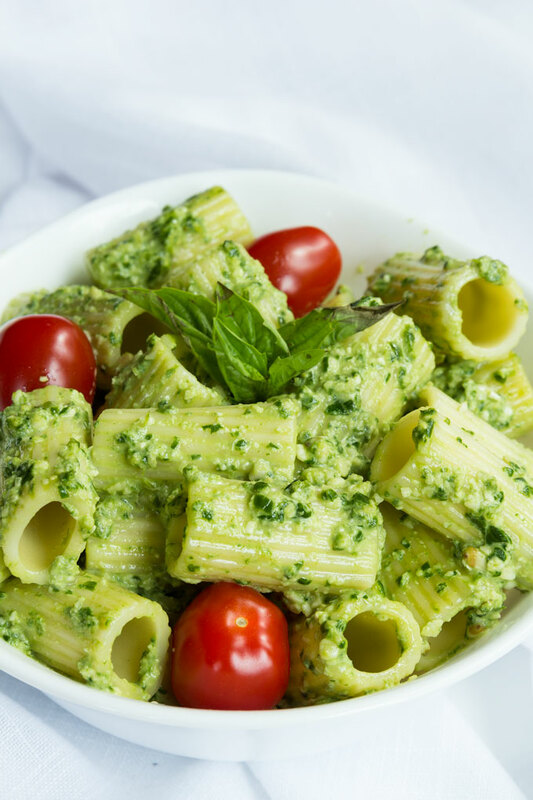 The best pesto leans towards the mild flavors of basil. While there are many types of basil, the sweet basil leaves tend to be the most recommended for pesto. The Genovese variety of sweet basil is the most flavorful with a floral, delicate aroma. You might not always find fresh baby Genovese basil leaves in your local grocery store, so the best thing to do (if you use basil on a regular basis), is to grow it yourself. Pesto is also known for its round flavors of the pricey Lingurian olive oil. The Ligurian Taggiasca olive oil is what many consider to be the best extra virgin olive oil. The Taggiasca olives are highly flavorsome with fruity undertones, which give off the impression of decisive sweetness. These olives are perhaps the most delicate in the world and are often used in high-end gastronomy. However, as chef Daniel Gritzer admits, “as long as you’re using a decent, somewhat mild olive oil, your pesto is going to be just fine”. Staying with the pricey ingredients, pine nuts are another typical ingredient. Many chefs recommend toasting the pine nuts first to draw out their essential oils and deepen their flavor. So, if you want to add a subtle nuttiness to your pesto, toast the pine nuts in a 350°F (175°C) oven until golden brown. I actually prefer the taste of raw pine nuts so I keep the pesto raw. While there’s no cheese in this pesto, you can imitate the cheesy flavor by using nutritional yeast. Nutritional yeast has a savory, umami-like flavor that’s cheesy and nutty. It’s relatively strong and pungent so a little bit goes a long way. Think of it as a seasoning – if you use too much, you’ll overpower the entire dish. To balance the olive oil, nutritional yeast, and garlic, I always add a splash of lemon juice to brighten up the flavor. Texture: the food processor essentially minces all the ingredients into a million uniform tiny pieces, creating a brighter green pesto with a uniform appearance. Flavor: the pestle and mortar grinds and pounds all the ingredients, causing the cell walls to burst and release an intense amount of fragrance (and hence flavor). Another thing to consider is time. I spent 5 minutes with the food processor and 30 minutes with the mortar and pestle. So yes, the pestled pesto is much more labor- and time-intensive. But then again, using the mortar and pestle over a blender definitely produces a more flavorful sauce. When combining the pesto with pasta, mix a few tablespoons of the cooking water into the pesto just before adding the noodles. The water dilutes the concentrated sauce and helps it adhere to the pasta. A classic Italian sauce bursting with fresh herby flavor. It's simple, raw, and requires only a few ingredients - loads of fresh basil, raw garlic, rich nuts, cheesy nutritional yeast, and fruity extra virgin olive oil. Bring a large pot of water to a boil, add a generous amount of salt, and cook the pasta according to the directions on the package. When the pasta is al-dente, drain and rinse it under cold water, and set it aside. Add the basil, pine nuts, garlic, nutritional yeast, lemon juice, and sea salt into a food processor and pulse until a loose paste forms. Slowly add the olive oil in a steady drizzle as you pulse the processor on and off. The pesto should be very smooth. Add 1 Tbsp. (15 ml) water at a time until a thick but pourable sauce forms. Heat up a medium saute pan and lightly char and blister the cherry tomatoes. Make sure you don't add any oil to the pan. The pan should be dry. Let the pan cool down for about a minute. Once the tomatoes are done and the pan has cooled a bit, add the pasta, give it a few tosses, and add a dollop of the pesto. Finish it all off with some baby spinach. Once you've added the baby spinach, give it a few tosses. Don't cook the pasta too much longer otherwise the spinach will wilt and sort of disappear into all the ingredients. 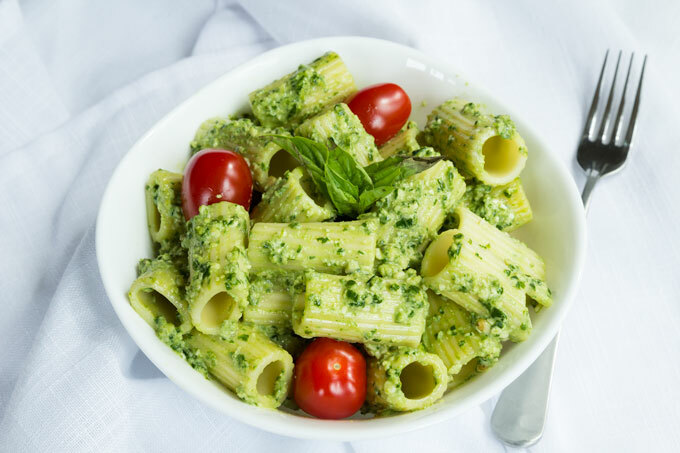 Store leftover pesto in an air-tight container in the refrigerator for up to 1 week. *I used quinoa rigatoni pasta. This recipe has been adapted from Food52. Wow, thank you for sharing this recipe. I never have been much into pesto, but thinking of all that great fresh basil I have been missing out on, I had to give this a try. Just whipped it up for lunch…so easy and fast. The only thing I changed was a little more garlic – because we grow our own and we love it so much. The roasted tomatoes put it over the top. Thanks again.